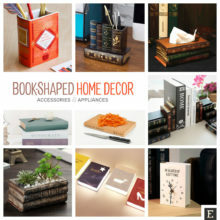 Here are the best bookish gifts you can currently find: home decor, jewelry, personal accessories, clothing, and more! 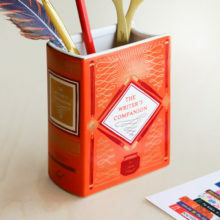 Check out the updated list of literary gifts for book lovers, no matter whether someone reads print or electronic books. Gift-giving is all about passing a real object from hand to hand. It’s followed by one of the most anticipated life pleasures – unpacking a gift box and see what’s inside. Print books are great gifts by themselves. You can’t say the same about ebooks. However, if someone loves reading, the real book is not her or his only dream. While many readers are already dedicated fans of ebooks, they can still keep that delightful feeling of dealing with beautiful objects. This post is about to show how many daily things can remind you that there is a book waiting for you on a bedside table. 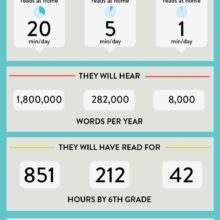 It’s all about changing a perspective and thinking for a minute about what a modern-day book lover would need. 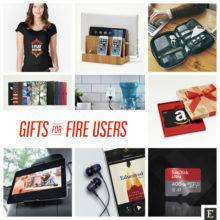 Because a Kindle ebook is not the only gift the Kindle owner would appreciate. What about anything that expresses the love for books? Posters, t-shirts, mugs, throw pillows, jewelry? Or maybe DIY bookish gifts? There are several paths to follow. 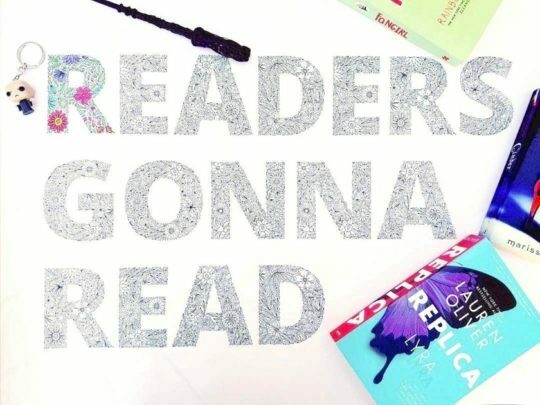 You can pick up a design that refers to a favorite book. 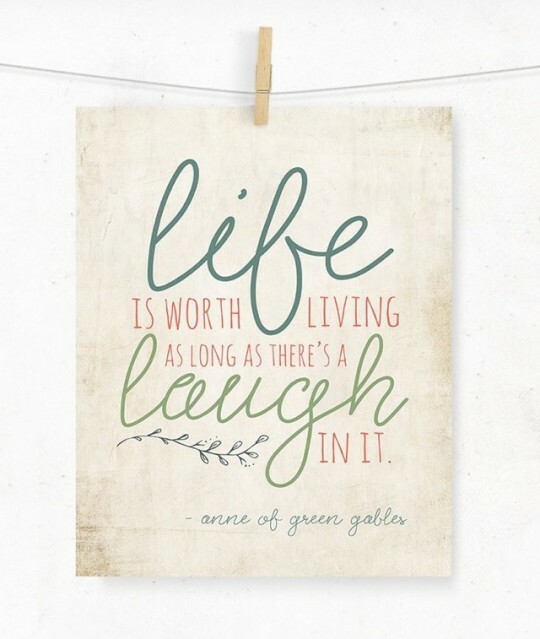 You can choose from beautifully visualized book quotes. You can select a design that is a clear statement of someone’s addiction to books. Finally, you can choose from book and library-scented candles and perfumes. 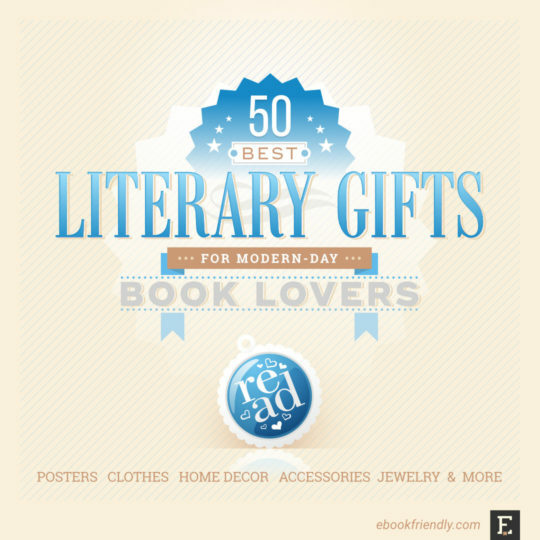 Best of all, there are many literary gifts that you can personalize. You can either add your own text, pick up an exceptional design, or even include own picture. In this regularly updated list, you will find the gifts for Christmas, Mother’s or Father’s Day, or for you beloved one’s birthday. If this overview is missing an item, please share it on social media or send us a hint via the contact form. Coffee and Books Scented Candle. 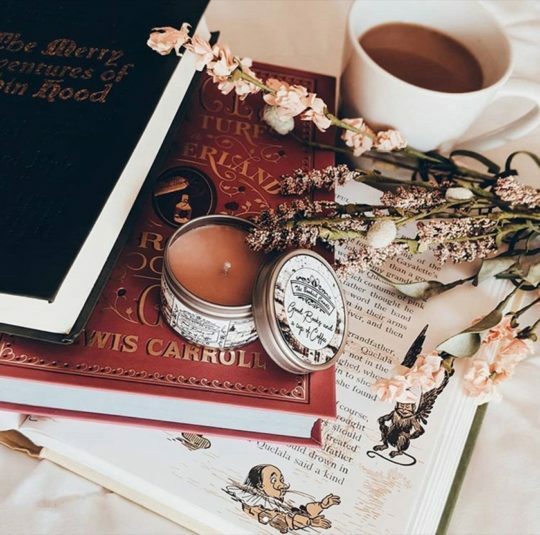 This scented candle will remind you of the best moments spent with books and coffee. A perfectly cute scent combines aged paper and Italian cappuccino, with gentle notes of brown sugar. The candle is available in three sizes, from 2 to 8 oz, and is made of 100% soy wax. ⇢ Etsy – from $7. Rupi Kaur Poems Literary Tapestry Room Decor. 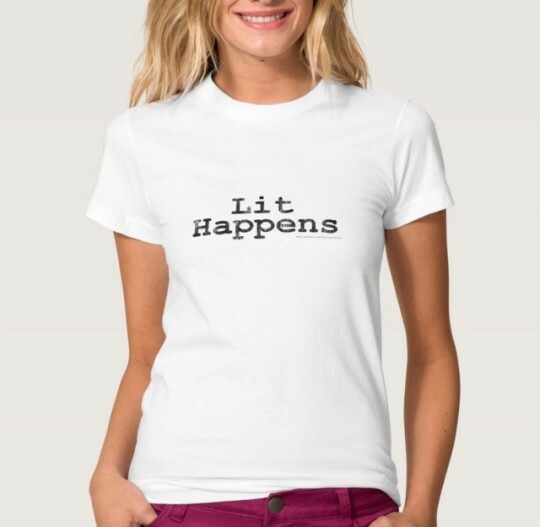 It’s one of literary bestsellers on Etsy. 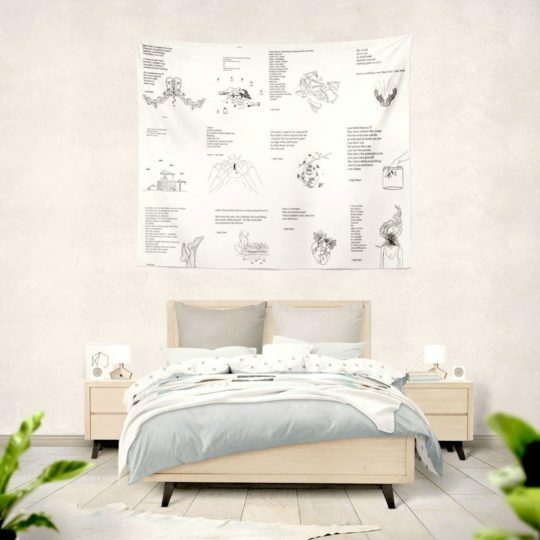 Created by The Book Tales, this customized cotton-poly tapestry features poems by Rupi Kaur. Its dimensions are 60 × 51 inches (150 × 130 cm). ⇢ Etsy – $37. “A Room Without Books” Poster. 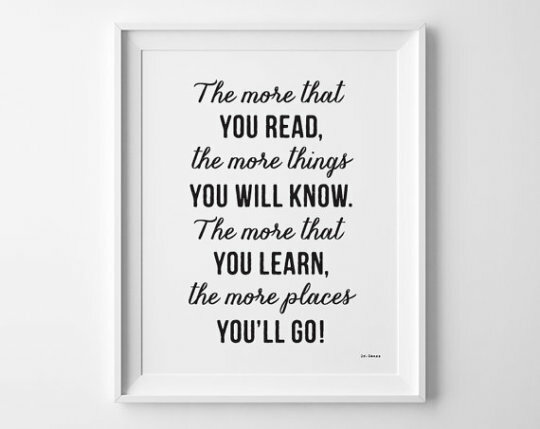 Even if you’ve completely switched to the Kindle, you can hang this stylish poster on a wall in a living room, because the format of the book doesn’t really matter. A room where there is a Kindle is a room full of books. 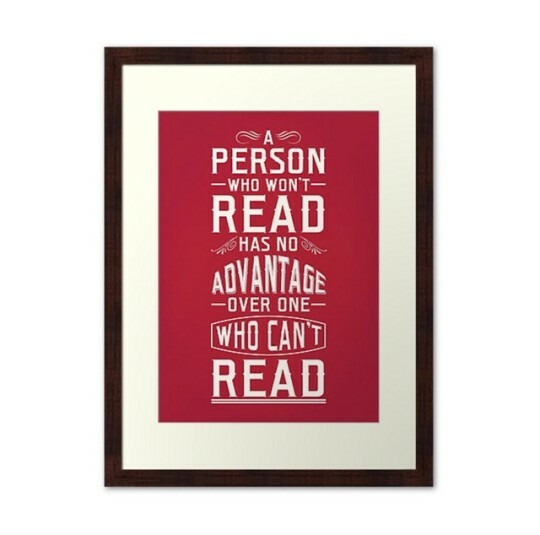 The poster is a part of a fantastic literary series from Toronto-based Design Different studio. You can order it printed in one of eight sizes, from 8 × 10 to 24 × 34 inches. ⇢ Amazon – from $19.99. 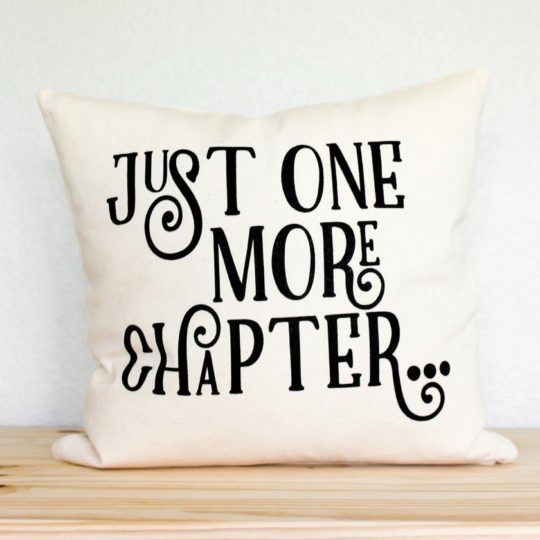 “Just One More Chapter” Pillow Cover. Who doesn’t want to spend just a few more minutes with a favorite book? The phrase most often used by book lovers makes more sense on some things and less on other things. The pillow is perfect. This beautifully designed pillow cover is one of literary best sellers on Etsy. You can also buy it together with an insert. ⇢ Etsy – $22. Folding Book Lamp. Here is a different, and very creative, idea. 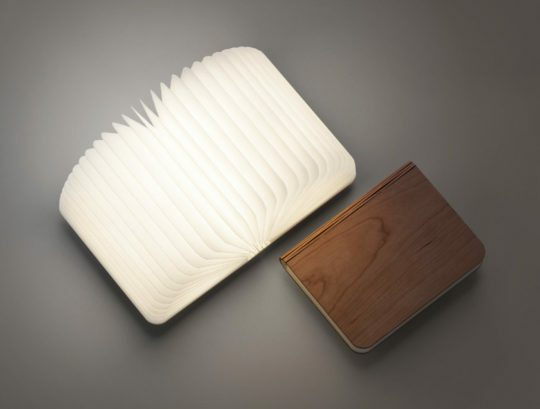 What would you think about the bedside lamp that looks like an open book? The design from Leditop features three light color options which you can change by closing and opening the book. Best of all, the lamp has its own battery, so you can use it even when there is no power. And when you don’t use it, just put it back on a bookshelf. ⇢ Amazon – $32. “Readers Gonna Read” Adult Coloring Poster. This is one of the most creative literary gifts. Instead of a coloring book, gift this coloring poster! It gives fun when you fill it with colors, and it will brighten up every place once you hang it on the wall. The poster is created by a talented Polish designer Anna Grunduls. It is 19 × 27 inches (50 × 70 cm) and comes in a sturdy poster tube. ⇢ Amazon – $14.99. The artwork is available in four sizes. The smallest one is 12 × 16 in, the biggest – 24 × 32. You can also order it framed. ⇢ Redbubble – $22.85. The print comes in four sizes, from 5 × 7 to 12 × 18 in. ⇢ Amazon – $14.99. 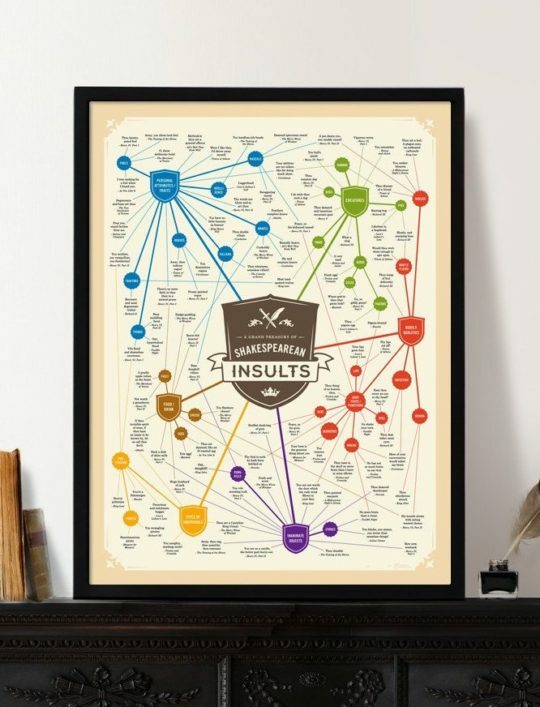 Shakespeare Insults Poster. A tribute to Shakespeare’s dagger-like wit, featuring 100 of his greatest zingers! The poster’s size is 18 × 24 in (46 × 61 cm). It’s printed on thick, certified archival paper, and each copy is signed by the artist. ⇢ Amazon – $29. 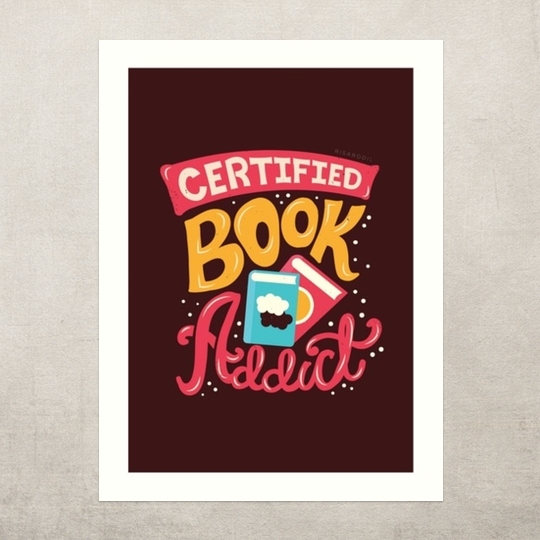 Certified Book Addict Poster. 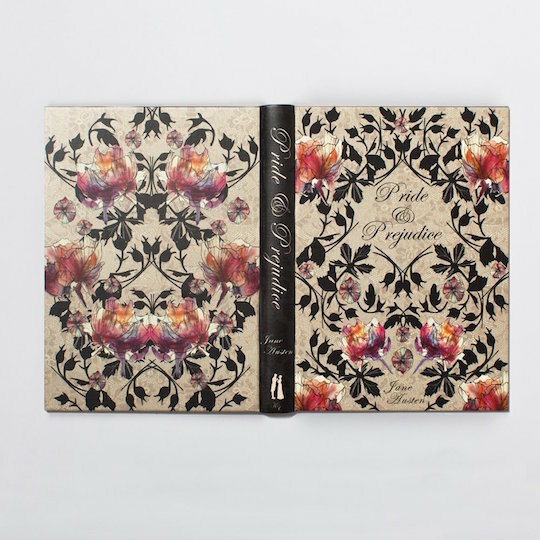 A gorgeous design from a lettering collection by a talented illustrator Risa Rodil. The design is available on photo prints, art prints, canvas prints, among others. There are many sizes to choose from. The large frame print is 16 × 22.6 inches. 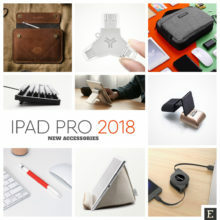 ⇢ Redbubble – from $10.64. “Read Me a Story” Nursery Print. 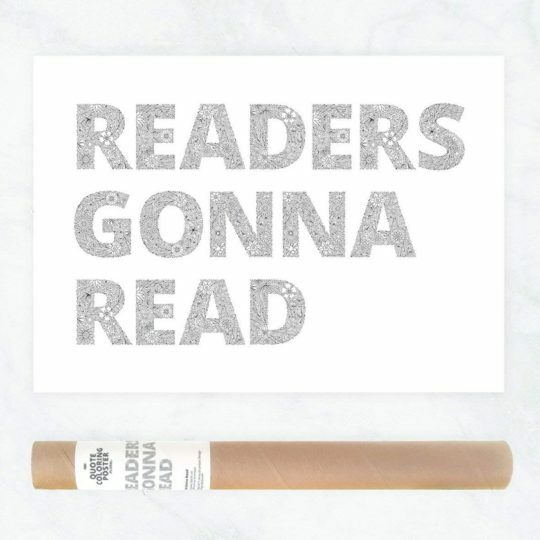 A beautiful typographic print perfect for a children’s room: “Read me a story, tuck me in tight, tell me you love me, kiss me goodnight.” Printed on 320 g distinctive quality card, A3 size. The text can be printed in five colors: Deep Pink, Grey, Teal, Vintage Blue and Bright Orange. ⇢ Etsy – $24. You can order the design in one of three dimensions: 5 × 7, 8 × 10 or 11 × 14 inches. The artwork is printed digitally with archival inks on 100 lb matte white paper. ⇢ Etsy – $10. “Today a Reader” Eye Chart. 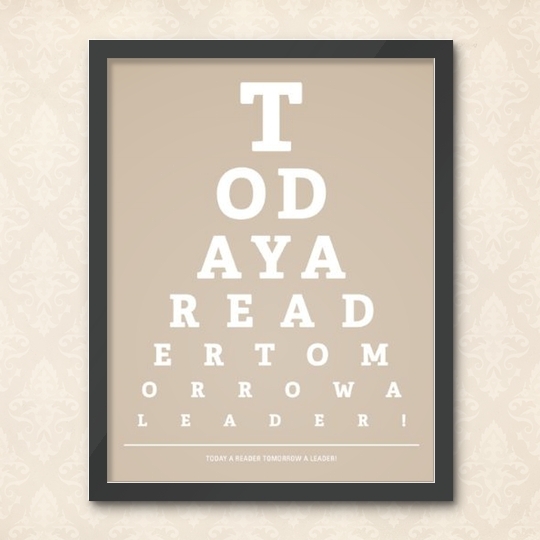 The text on this creative eye chart reads: “Today a reader, tomorrow a leader.” The poster is printed on heavyweight 270 gsm matte fine art paper, using archival pigment-based ink for outstanding image quality. There are two sizes to choose from: either 8 × 10 inches or 10 × 12 inches. ⇢ Amazon – $6.99. Antique Books Scented Candle. 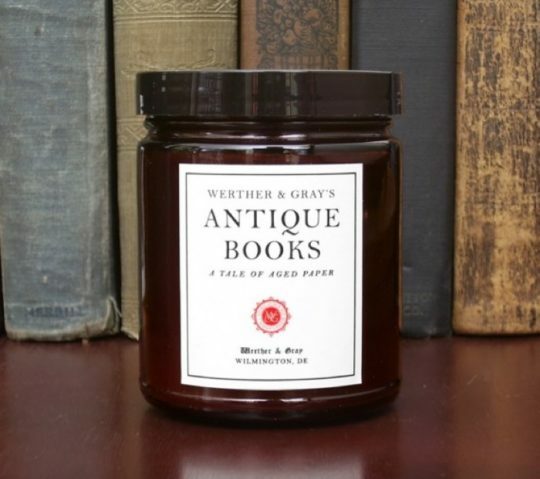 From Werther & Gray comes a series of scented candles inspired by books and literature. The leading scent is Antique Books – company’s original recipe that replicates the scent of aged books. Among Werther & Gray’s most popular literary candles are Mary Shelley, Oscar Wilde, Flannery O’Connor, and Edgar Allan Poe. ⇢ Etsy – $18.99. Harry Potter Quidditch Throw Pillow Cover. 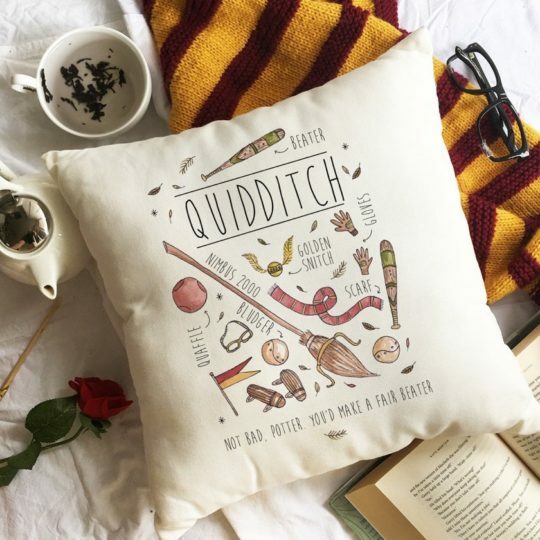 A gift idea not only for Harry Potter fans – an original design by Laura Wright Studio printed on a super soft cushion cover. The design is printed on both sides of the pillow cover. You can order a custom print, as well. ⇢ Etsy – $29.50. 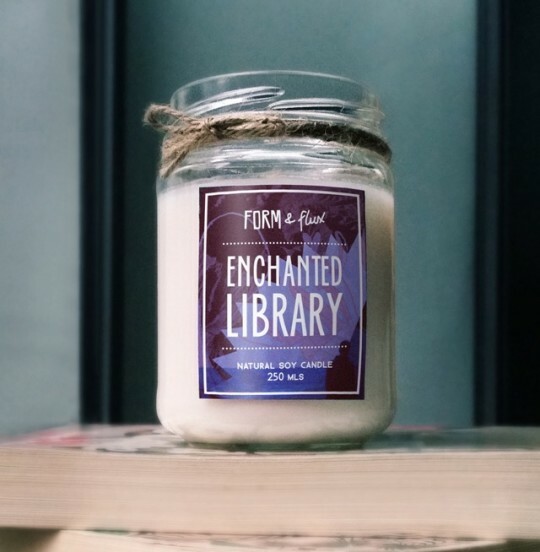 Form & Flux “Enchanted Library” Candle. This soy wax candle, designed and hand-crafted by Form & Flux, gives a marvelous feeling similar to that of being surrounded by shelves filled with books. Light the candle and you’ll feel the aromas of vanilla, parchment, honey and coffee beans, all gently blended into a unique scent. Just like all other Form & Flux candles, “Enchanted Library” is made with natural soy wax and essential oils. The minimum burn time is 25 hours. ⇢ Etsy – $16.95. Dramatic “The End” Bookend. 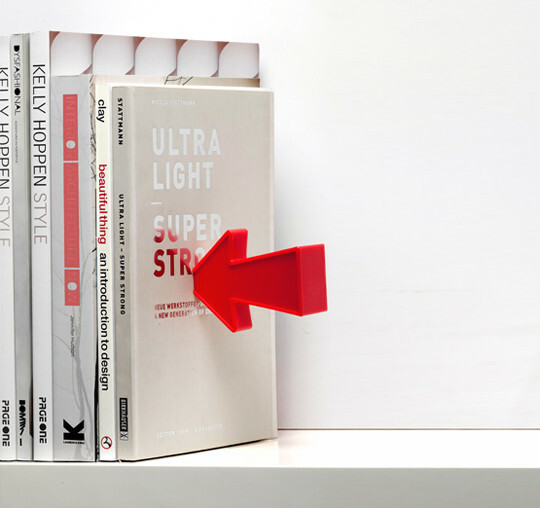 It’s one of the most popular bookend designs. Created by Fred & Friends, and called “The End” it says just that: the books look like they’ll fall on the small man who tries to save his life. 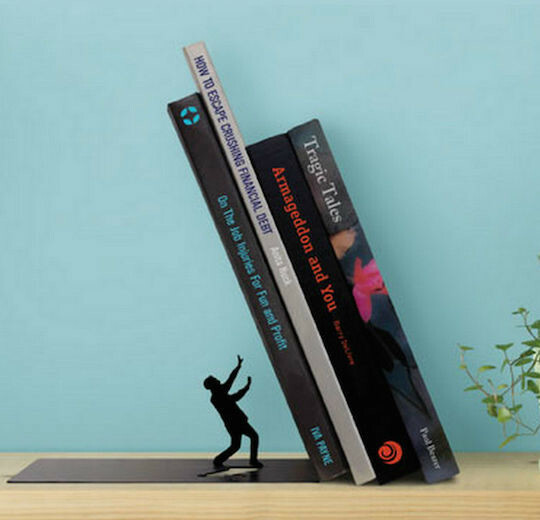 The bookend is made from powder coated steel and measures 4.5 × 7 × 5 inches. ⇢ Amazon – $24.29. Arrow Magnetic Bookends. These bookends from Peleg Design are extremely clever. They look like floating above the surface. The illusion is created by using magnets in the arrows. Thanks to them the arrows can be drawn to metal holders hidden behind the covers of the last books. ⇢ Amazon – $19.99. 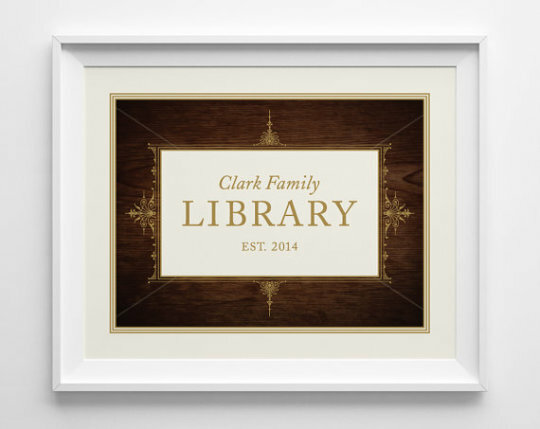 Personalized Library Sign. 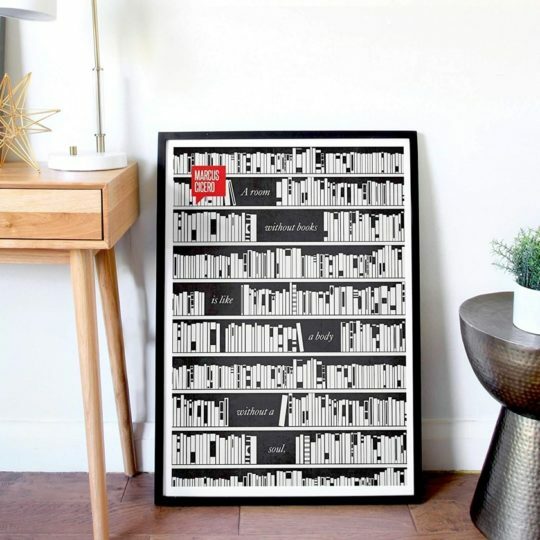 A perfect gift for a family of book lovers. This sophisticated artwork can be placed at the entrance to a home library. It measures 8 × 10 or 11 × 14 inches. It’s printed digitally on matte ivory paper (100 lb). In a message to seller please provide the text to be included in the sign. ⇢ Etsy – $24. 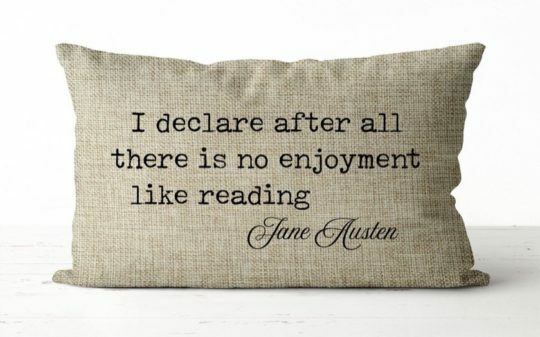 Jane Austen Quote Pillow. “A declare after all there is no enjoyment like reading.” Especially when you read in a cozy sofa on a cute pillow from the Pillow Geek. The pillow measures 12 × 18 inches, and you get both the cover and insert. ⇢ Etsy – $24.95. The Literary Tea Collection. 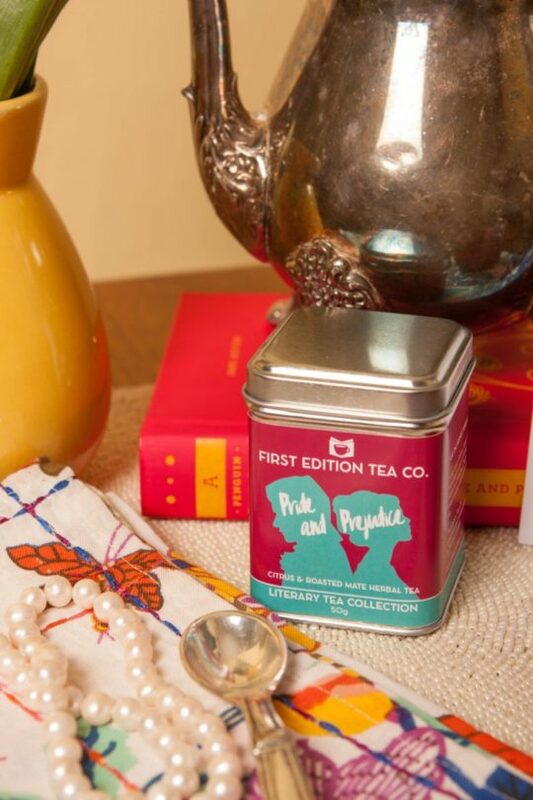 A wonderful gift for everyone who loves reading books: a collection of literary tea blends created by First Edition Tea Co. Five delicious blends are offered: Pride and Prejudice, Jane Eyre, Alice in Wonderland, The Great Gatsby, and Sherlock Holmes. The blends are hand-crafted in Toronto in small batches from high-quality ingredients. They are available in 50 g tins. ⇢ Etsy – $13. As metal stamping is a careful process done by hand, there will be slight variations in letter depth and placement compared to the picture above. If you order a set of six spoons, each one will be truly unique. ⇢ Amazon – $20. Kindle Paperwhite 4. The long-expected 4th-generation Paperwhite is the most exciting Kindle in years, and the only e-reader you need. The Paperwhite is waterproof. You can take it to a bath or swimming pool, and even if it drop 2 meters under water, nothing will happen to it. 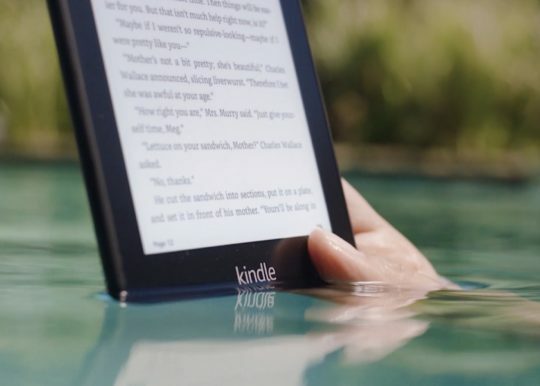 The new Kindle will enable you to listen to Audible audiobooks. 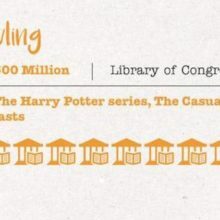 The bigger storage (8 or 32 GB) will let you upload hundreds of audiobooks for offline playing. Finally, there is a sleek design, with a smooth glass front, giving more pleasure from reading than ever before. ⇢ Amazon – $129.99. Personalized Kindle Case from Caseable. 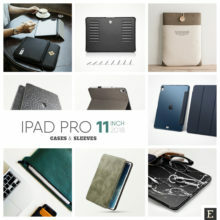 Caseable is a #1 destination for unique and personalized tablet and Kindle cases. 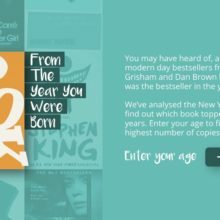 The site offers hundreds of trendy designs for Kindle Paperwhite and other e-readers, created by most talented designers from around the world and curated by the Caseable team. 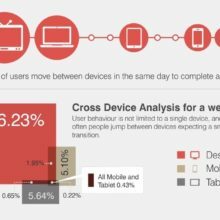 What’s more, you will be able to personalize the visual you select. On Caseable, you can browse designs in several categories, from abstract patterns, to cartoons, to fashion, to nature, to typography, to celebrities. 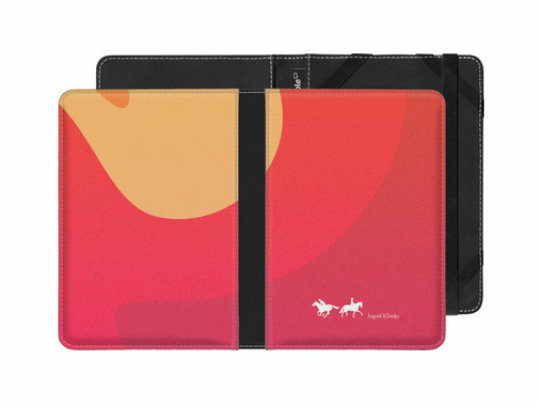 ⇢ Caseable – $29.90. 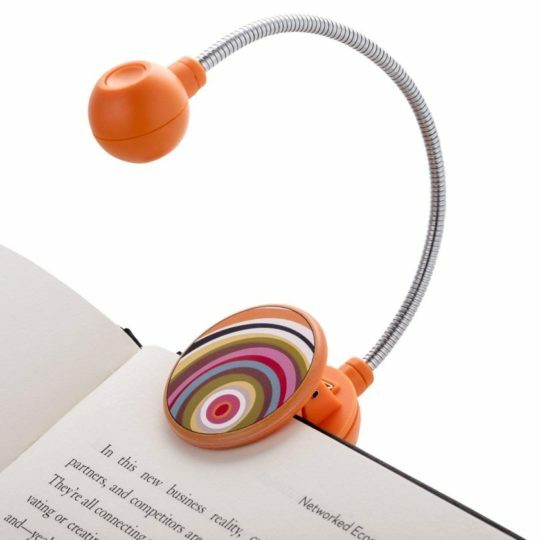 Colorful LED Book Light. Who said book lights have to be boringly black? From French Bull comes a series of insanely colorful LED book lights that could be used for reading print books and ebooks (if your e-reader doesn’t have a built-in light). Each light has an adjustable neck that will allow you to evenly light the page. It comes with two lithium coin cell batteries. You can fold it completely for easy transport. ⇢ Amazon – $9.99. KleverCase Book Cover for Kindle. These wonderful covers are handmade in England using traditional bookbinding techniques. Each cover is slimline, lightweight, durable and splash proof – and perfectly imitates the look and feel of a classic hardcover book. A number of classic covers is available, including To Kill a Mockingbird, The Secret Garden, and Pride and Prejudice (shown above). ⇢ Amazon – $25. Vintage Children Books Smartphone Case. 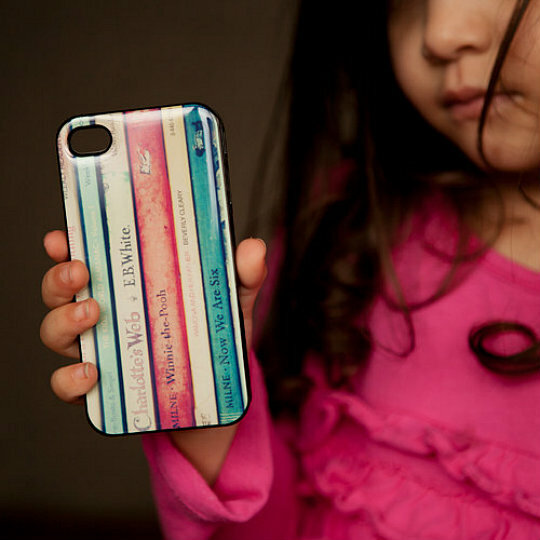 This durable case features a nostalgic photo of book spines of popular children’s books. It’s scratch resistant – made from polycarbonate used for motorcycle helmets. The full-color, high-quality image is printed all over the case. Available for latest models of iPhone and Samsung Galaxy. ⇢ Etsy – $30. 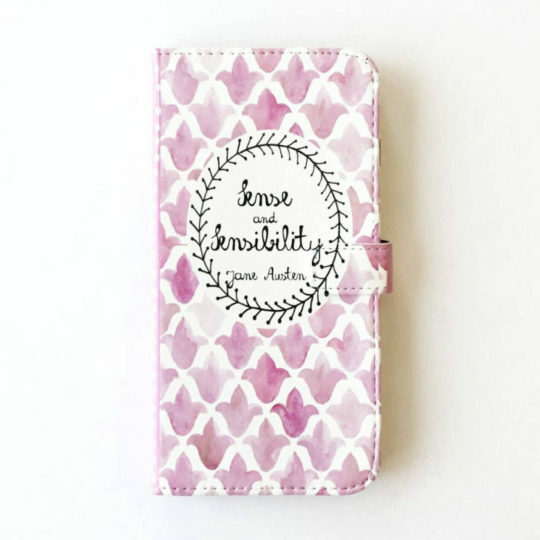 “Sense and Sensibility” Book Wallet Smartphone Case. Chiclit Designs offer this classic book cover art on cases for several models, including iPhone, Samsung, LG, and Google Pixel. The artwork is permanently printed on a high-quality PU leather wallet case, providing durable protection for your smartphone. 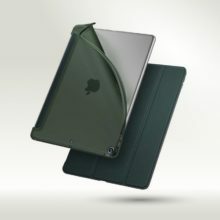 It includes interior credit card slots, and a large pocket for cash. In Chiclit Design shop on Etsy, you can find almost fifty smartphone cases that are featuring book covers from classic novels. ⇢ Etsy – $29. BluCase Sleeve for Tablets and E-readers. 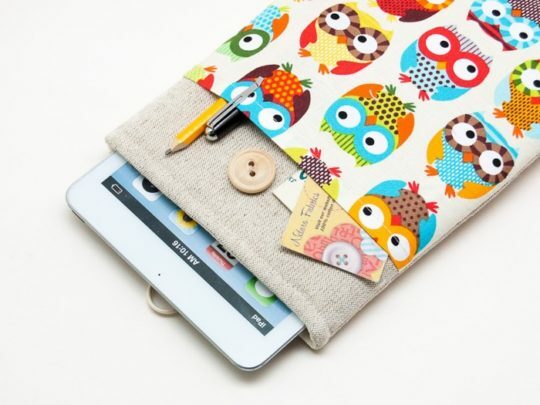 BluCase is our favorite Etsy shop offering e-reader and tablet accessories. It offers high-quality sleeves for many models, all in trendy colors. They are made from durable printed linen and 5 mm foam for extra protection. There is a long list of supported models, including latest Kindle, Kobo, or Nook. You can also place the custom order by sending a message to seller with exact dimensions of your e-reader or tablet. ⇢ Etsy – $19.99. 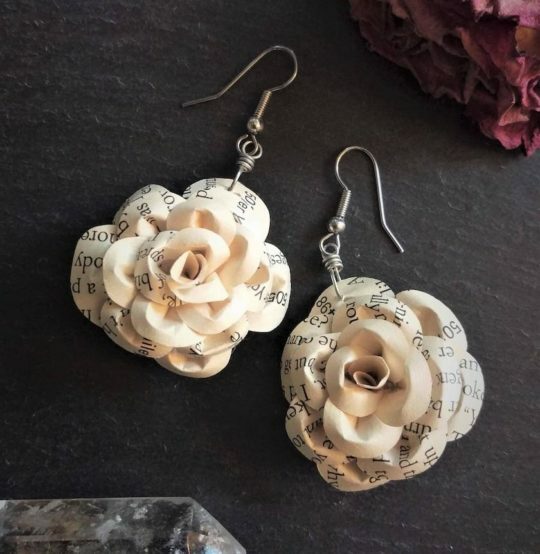 Upcycled Book Lover’s Ivory Rose Dangle Earrings. These beautiful earrings are made from the pages of recycled books, and are a perfect combination of elegance and geek chic. The earrings are featuring surgical steel ear wires to ensure they are hypoallergenic. ⇢ Etsy – $29. “To Kill A Mockingbird” Book Brooch. 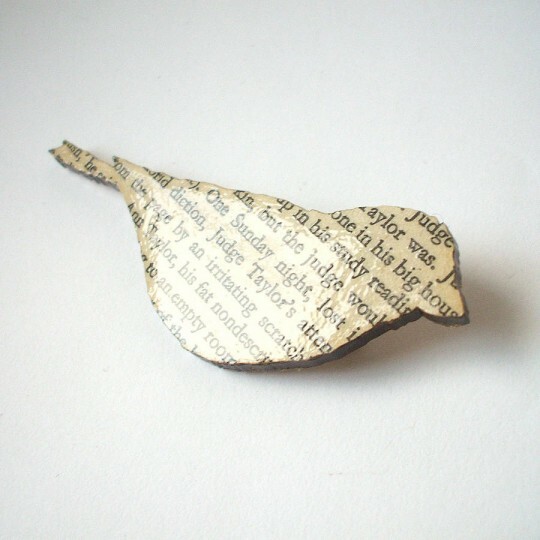 One of the most beautiful gifts for book lovers, this finch brooch is made from original pages from damaged copies of Harper Lee’s classic book. Each brooch is different. The text is always carefully selected to include names of major characters or famous passages. ⇢ Etsy – $13. 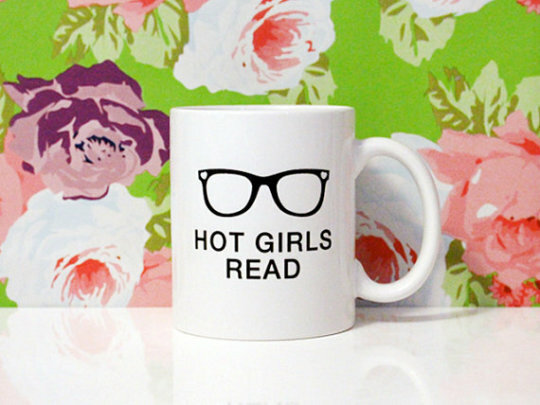 “Hot Girls Read” Coffee Mug. A solid white 11oz mug, with a text “hot girls read” and a pair of glasses. The design is only on one side, handle on the right. ⇢ Etsy – $14.50. Books Are Better Pin Badge. 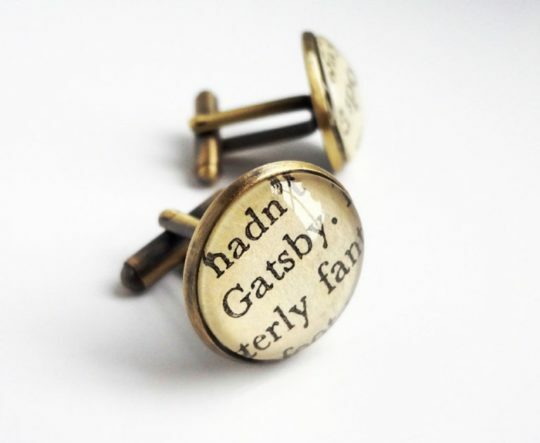 This is just one from dozens of lovely literary accessories created by Fable & Black and offered on Etsy. The pin features the famous quote by George R.R. 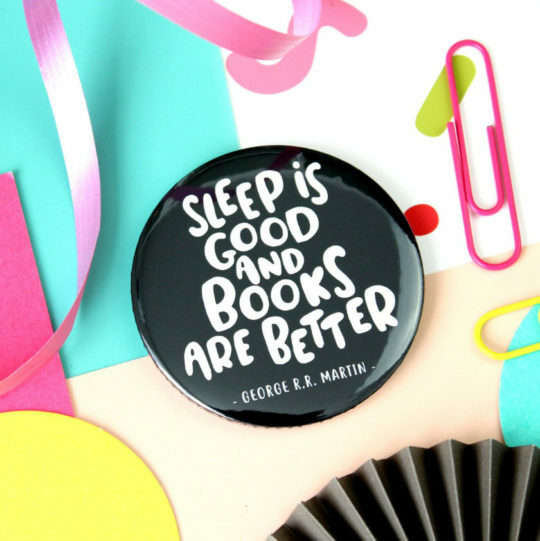 Martin: “Sleep is good and books are better.” You can choose it to be placed on either a badge or pocket mirror. ⇢ Etsy – from $3. The mug is 15 oz and is dishwasher safe. ⇢ Etsy – $16. 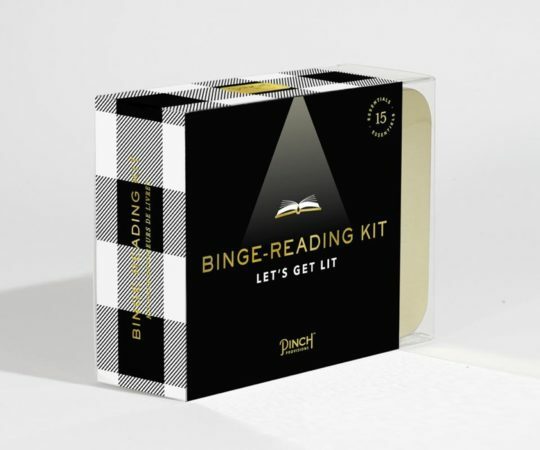 Binge-Reading Kit. 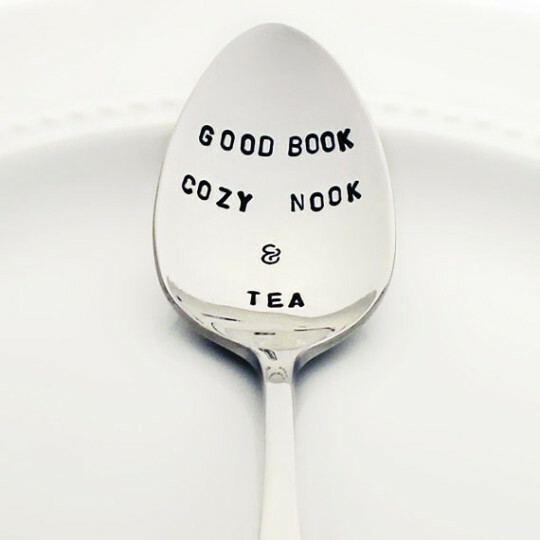 A must-have accessory for every book lover. 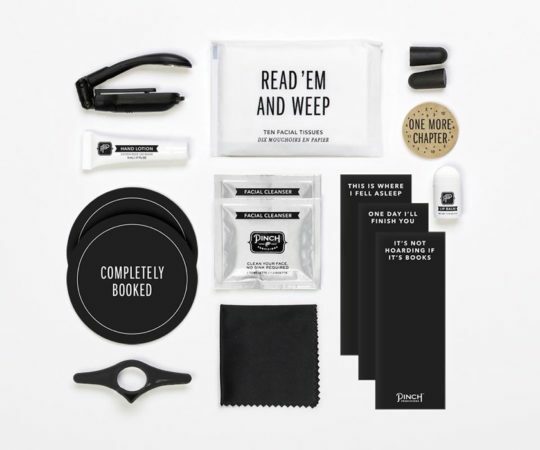 This binge-reading kit from Pinch Provisions includes: microfiber cloth for glasses or e-reader, decision coin, three bookmarks, ear plugs, lip balm, hand lotion, two coasters (2), “read & weep” facial tissues, reading light, facial cleansing towelettes, and thumb page holder. ⇢ Amazon – $22.99. Harry Potter “Espresso Patronum” Coffee Mug. 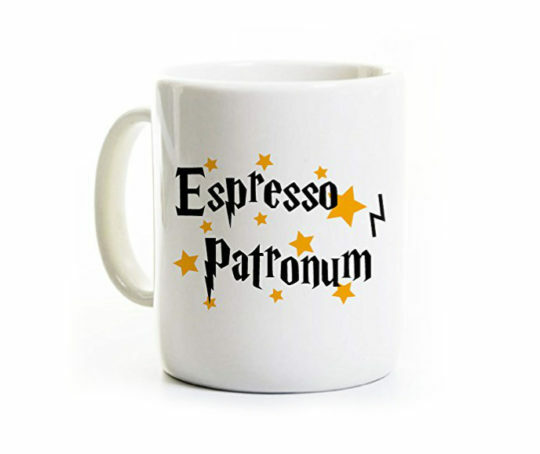 A paraphrase of “Expecto Patronum,” a famous spell from Harry Potter and The Prisoner of Azkaban, is perfect for a coffee mug. The mug is 11 ounces and has a glossy finish. It’s dishwasher and microwave safe. ⇢ Amazon – $14.99. The cufflinks are 16 mm in size and set with a glass lens to seal in the paper. ⇢ Etsy – $24.95. Miniature Book Keychain. A great little gift from Akinto. 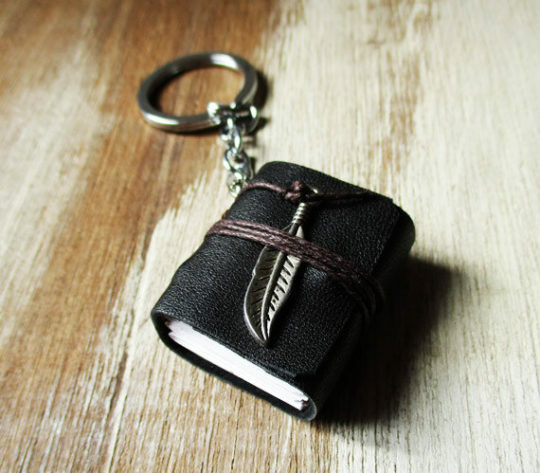 This miniature book is hand-crafted in recycled leather and features a silver finish feather charm to a brown cord. Akinto shop offers dozens of vintage accessories that will inspire you and uplift your spirit. Besides miniature books, you’ll find here gorgeous lockets with inspirational quotes from books. ⇢ Etsy – $20. “Not All Those Who Wander Are Lost” Spiral Necklace. 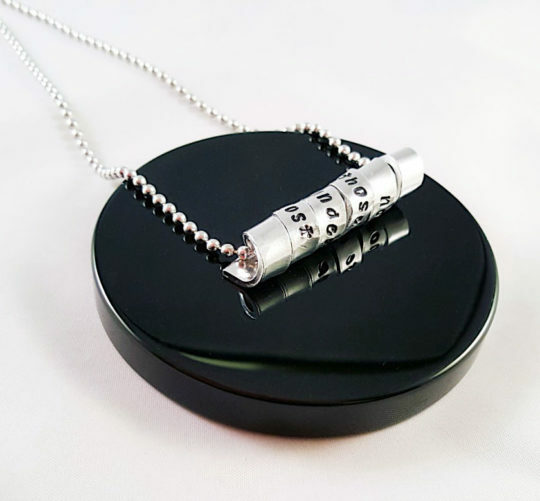 This quirky necklace is perfect for both book lovers and adventure seekers. It features aluminum scroll stamped with J.R.R. Tolkien’s famous quote “Not all those who wander are lost.” ⇢ Etsy – $20. 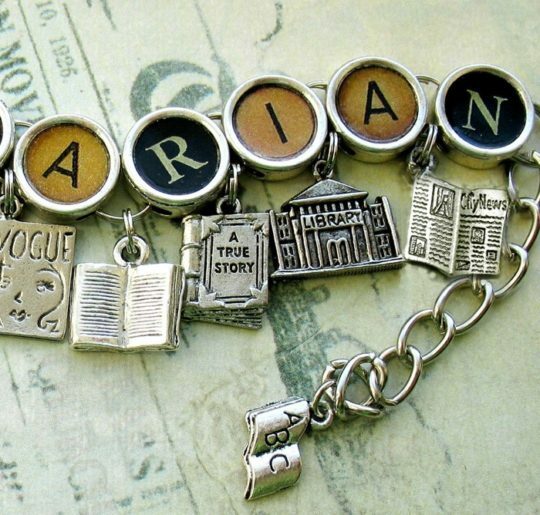 Librarian Bracelet. A Likely Story is a shop famous for highly original bracelets that consist of a few charms – each one displays one letter of a book statement. Above, you see the bracelet forming the word “librarian.” The silver-colored letter beads are replicas of old fashioned typewriter keys. ⇢ Etsy – $39.95. 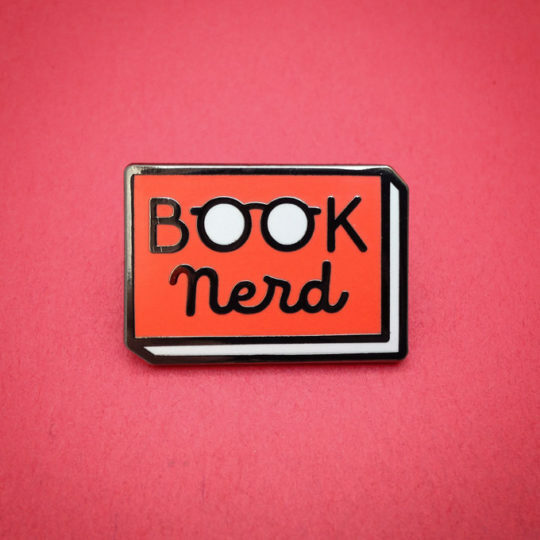 “Book Nerd” Enamel Pin. This one-inch cloisonne hard enamel pin in black nickel features the text “book nerd,” and comes from a collection of gorgeous bookish gifts handmade by Andrew Brozyna. Among other pins, Night Owl Book Club will definitely draw you attention. We also love Book Wyrm design. ⇢ Etsy – $10.20. Padded Book Pouch with Pen Loop. If you want to make sure nothing will happen to the book you are currently reading, think about getting the book pouch. The one from Lukie Dukie is both funny and functional. 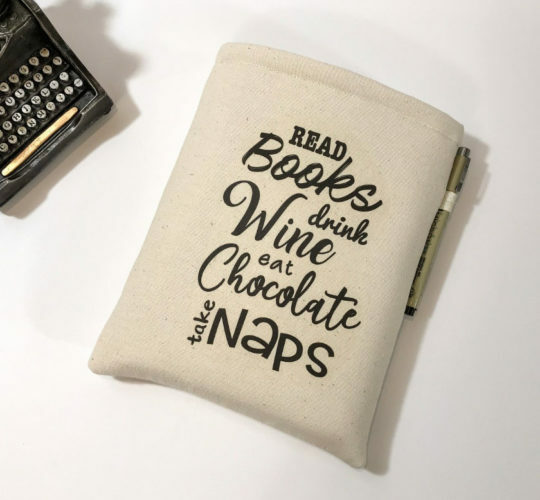 It’s padded for extra protection, and features a text: “Read books, drink wine, eat chocolate, take naps.” ⇢ Etsy – $15. Read Eyeglass Ceramic Ring Chain. 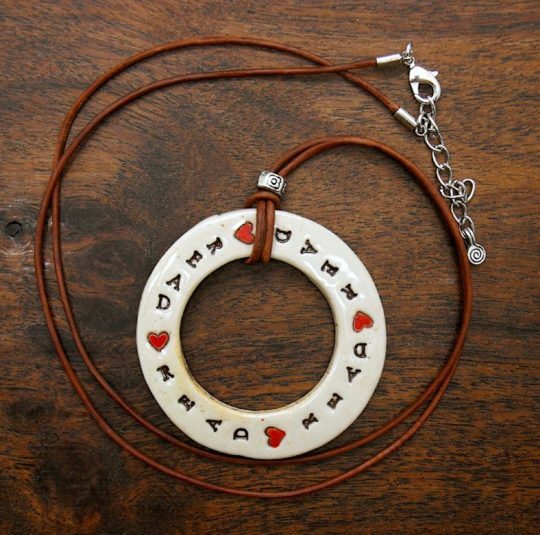 This gorgeous piece of jewelry is made of leather and a stamped porcelain ring, and you can use it as a holder for your reading glasses. The chain fastens with a lobster claw. You can adjust its length from 26 inches to 28 inches. ⇢ Etsy – $20. 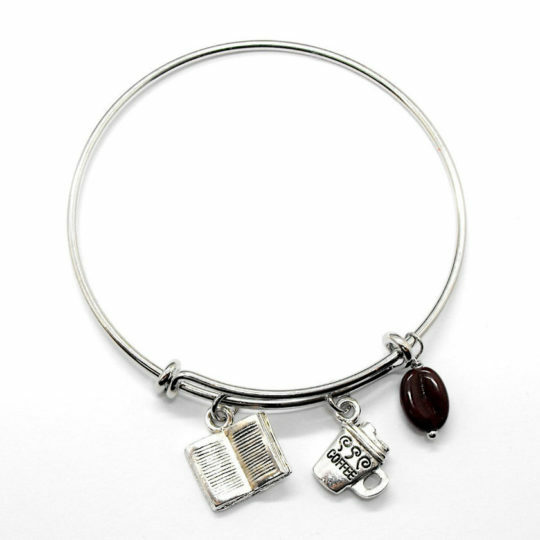 Coffee Book Lover’s Bangle Bracelet. From Little Frou Frous comes a beautiful stackable bangle bracelet that features book and coffee cup charms and a little glass bead in the shape of a coffee bean. The bracelet is available in silver or golden tone, and is adjustable between 2.5 and 3 inches. ⇢ Amazon – $17. 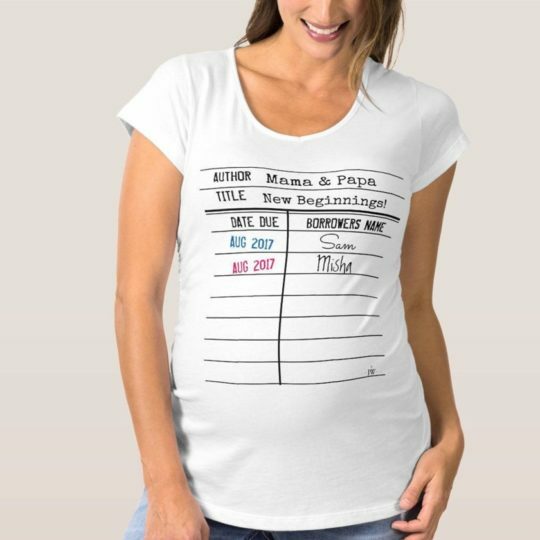 Library Due Date Pregnancy T-shirt. Now, an iconic library due date design can show the world when the new book lover will be born! The shirt is a fun and unique gift for the book-loving woman in your life. The library due date typography is carefully applied by hand. You can, obviously, customize the message, by writing down in a message to seller what text to appear in the blank fields of the card. ⇢ Etsy – $35. “She Reads Books” T-shirt. 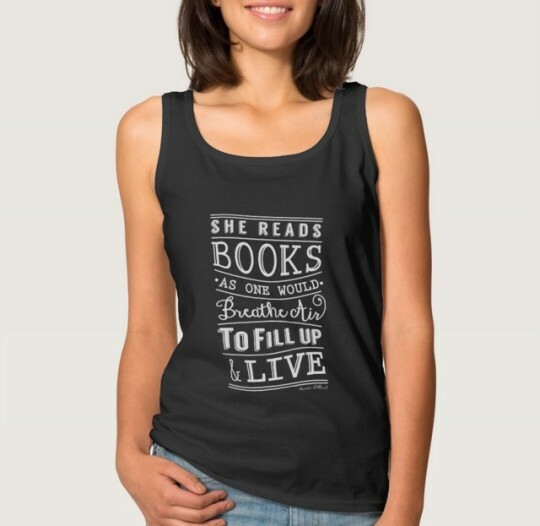 A beautiful design by Kat Parella shows Annie Dillard’s quote: “She reads books as one would breathe air, to fill up and live.” The artwork works on all dark tee colors. You can pick up one of over 150 clothing style, not only t-shirts but also long sleeves, polos, tank tops, or sweatshirts. ⇢ Zazzle – $24.50. 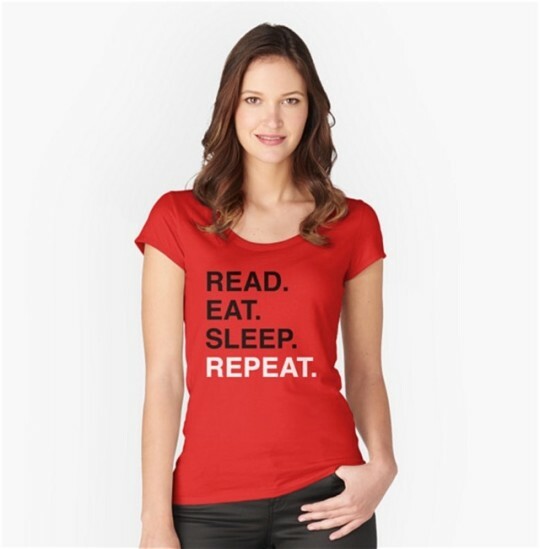 “Read Eat Sleep Repeat” T-shirt. A simple and bold statement in a minimalist treatment. On the picture above you see the red women’s fitted scoop t-shirt, but you can select from over ten other clothing styles, both for women and men. The sizes are from XS to XL. You can order to have the print on the front or back side of the t-shirt. ⇢ Redbubble – $30. For women, men, and kids. Forty colors and over one hundred styles to choose from, including long sleeves and sport t-shirts. ⇢ Zazzle – from $21. Color: Dark Kelly Green. Regular fit for women and men. Five sizes: from S to 2XL. There is also a version for kids. ⇢ Threadless – $22.50. 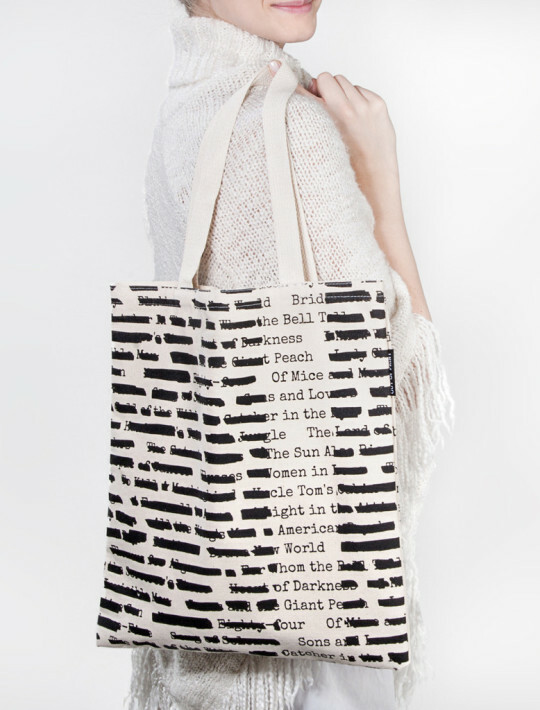 Banned Books Tote Bag. An Out of Print original design to celebrate banned books and Banned Books Week. The design is printed on heavyweight cotton canvas. There is an inner pocket. The bag is 13.5 inches wide × 15.5 inches high, with a 10-inch strap. ⇢ Amazon – $18. Pride and Prejudice Scarf. A unique gift for a book lover: a stylish infinite/loop scarf with quotes from Jane Austen’s Pride and Prejudice. Super soft modal blend, with raw edges. The scarf measures: 62 inches (158 cm) around, and 28 inches(71 cm) wide. ⇢ Amazon – $25.50. John Green Quote Scarf. 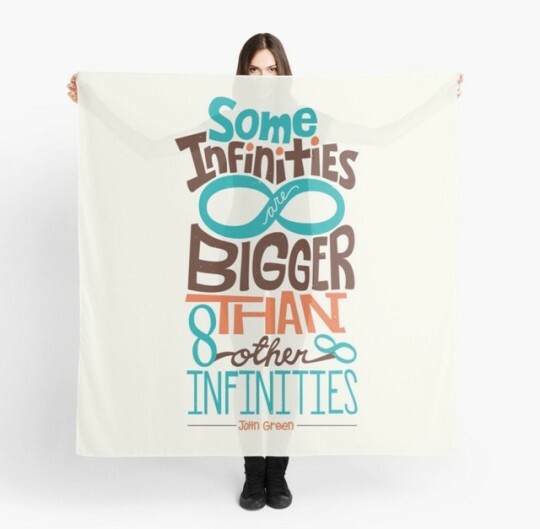 This large 55-inch square scarf features one of the most popular quotes by John Green: “Some infinities are bigger than other infinities.” The print is available on front and back. 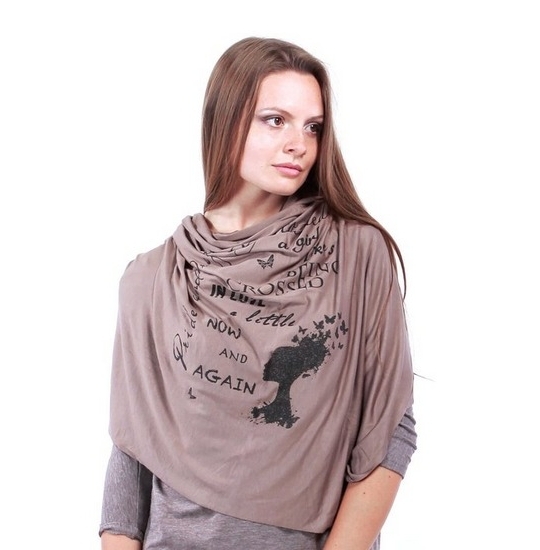 The scarf is made from a microfiber polyester and has a slightly transparent effect. This tremendously adorable typographic layout was designed by Risa Rodil. It’s also available on t-shirts, posters, and accessories. ⇢ Redbubble – $32. 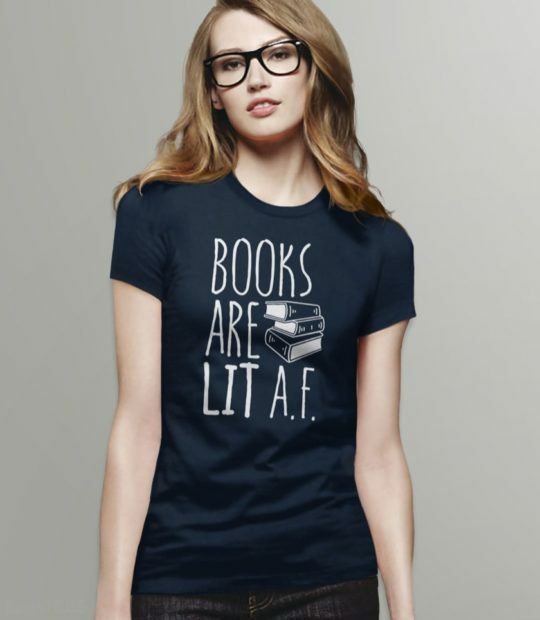 Books Are Lit A.F. T-shirt. Make a bold statement with this Lit A.F. t-shirt from Boots Tees. The t-shirt is lightweight, made of 100% 4.3 oz soft-spun cotton. The design is printed directly into the shirt with a high-end garment printer. Available in unisex, women’s and junior sizes. ⇢ Etsy – $24. Romeo and Juliet Printed Tights. 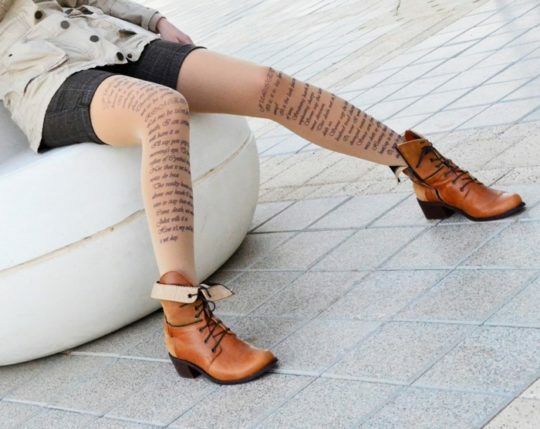 From Coline Design comes a series of literary tights, and one of them features passages from Shakespeare’s Romeo and Juliet. These opaque soft microfiber tights are hand-printed on the front. “Printed Tights are a hot fashion trend that adds a touch of style to any dress, skirt, or shorts.” ⇢ Etsy – $24.90. 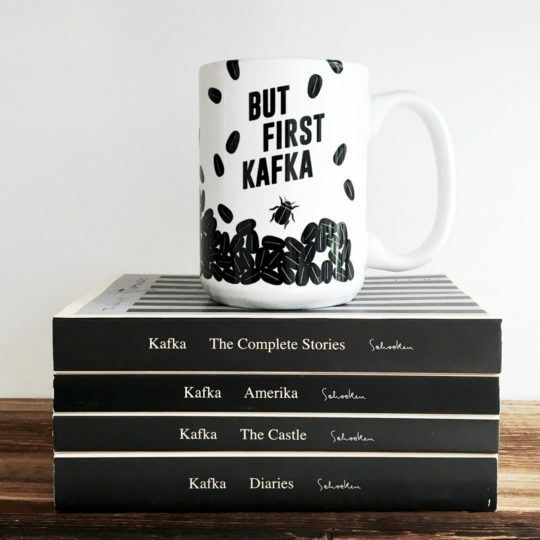 Where to buy literary gifts? Etsy – this is the biggest online store with handmade goods. 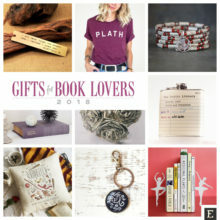 The selection of bookish gifts is impressive, so Etsy is a must-see destination, especially if you want to gift something unique in style. As all items are made to order, there are several ways to add a personal message, also for the bookish items listed above. Zazzle – the store offers a huge variety of merchandise, from clothing, to home decor, to personal accessories. 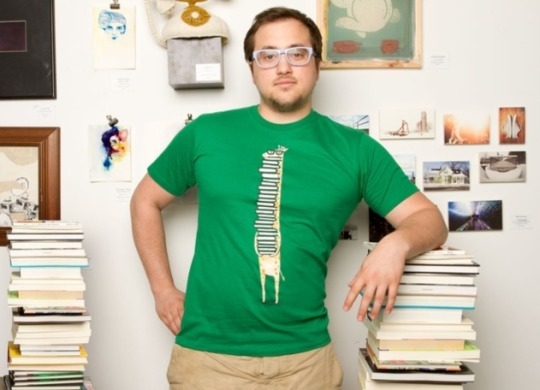 Users can upload own image, or pick up one of thousands available designs. Redbubble – a marketplace for custom designed items, including prints, stationery, case covers for smartphones and tablets, or t-shirts. Opposite to other sites, such as CafePress, the quality of the artwork is very high. Amazon Handmade – if you are an Amazon customer, you should check out this quickly growing store section. It includes over hundreds of thousands of hand-crafted items, many can be personalized. You’ll find here jewelry, home decor, kitchen & dining, furniture and stationery, among other categories. 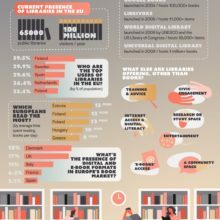 Are you interested in how reading evolves in digital times? Make sure to get free updates by RSS or email. Let’s also connect on Facebook, Twitter, and Pinterest.